We came, we saw, we conquered. From snagging Nobel prizes to becoming heads of state to working the balance beam like a boss, women around the world have accomplished some pretty neat stuff so far in the 21st century. While you might find women's accomplishments of the distant past to be more up your alley — everyone knows an afternoon thinking about Amelia Earhart's transatlantic solo flight is an afternoon well spent — we've had plenty of time to commemorate those milestones. So here are the news stories of the last 15 years that reminded us just how awesome women are. After making history by winning the Wimbledon doubles title as sisters, what better cherry on top of the sundae than to get the Sportswomen of the Year title, as sisters? The two have continued to dominate the tennis world pretty much ever since. The real-life Erin Brockovich took on a class-action lawsuit in the 1990s against the Pacific Gas & Electric Company, which knowingly contaminated a California community's water and hid the fact. It was with Julia Roberts's awe-inspiring portrayal of Brockovich in Steven Soderbergh's film version of the case that the world learned about the badass, bootstrapping legal clerk. Sherron Watkins, who was vice president of corporate development at the Enron Corporation, testified in early 2002 before committees from the House and Senate about the company's fraudulent accounting and financial reporting. She was selected as one of TIME's "Persons Of The Year," and she was joined by her fellow whistleblowers, WorldCom's Cynthia Cooper and the FBI's Coleen Rowley. The former American soldier was serving in the U.S. invasion of Iraq in 2003 when her company found itself in enemy territory in the city of Nasiriya. After a fire fight that resulted in over 10 U.S. soldiers' deaths, Lynch was captured by Iraqi soldiers and held at Saddam Hospital. And whether you believe the details of the more dramatic version of Lynch's rescue (other reports claimed the rescue operation to be more on the uneventful end of the spectrum), Lynch survived a traumatic experience and was willing to share it with the world. Martin and Lyon had been lovers for more than 50 years when they tied the knot in San Francisco in 2004. The two founded the Daughters of Bilitis, the first social and political organization for lesbians in the United States. Their marriage was voided by the California Supreme Court later that year, but they didn't give up: they married again in 2008. That's right. We're not talking one country, but the entire continent. And her journey to becoming Liberia's president wasn't easy. She was sent into exile in 1980 after a military coup and, after returning to her native country, was sentenced to 10 years in prison. Later, former President Charles Taylor charged her with treason after Johnson Sirleaf ran against him in the 1997 presidential election. She became known as the "Iron Lady," clearly for a reason. Just after turning 40, Ansari became the first self-funded woman to fly to the International Space Station; she was also the first Muslim woman in space. Her other accomplishments? She was the co-founder, CEO, and chairwoman of the board for Telecom Technologies, Inc. Ansari then went on to co-found and chair another tech company, Prodea Systems. She probably didn't need to go to space for people to believe she'd done plenty in her life, but that's okay. Pelosi was actually nominated by her Democratic caucus in November 2006, but wasn't elected until January of the following year, when she beat out Republican John Boehner for the House Speaker position. In addition to being the first female Speaker of the House, Pelosi still retains, to date, the title of highest-ranking woman politician in U.S. history. It was this year that Hillary Clinton became the first woman to make it as far as runner-up for the Democratic nomination, and Sarah Palin became the GOP's first female vice-presidential candidate. Just think about how boring the campaign would have been without that doctored photo of Palin wearing an American flag bikini and holding a rifle. Susan Boyle may have dreamed a dream, but what was way better than that dream was her singing about it. Proving to everyone that judging a book by its cover is just plain stupid, Boyle shocked the audience and judges at the Britain's Got Talent auditions with her rendition of the Les Miserables ballad. Watson was not only named Hollywood's top female earner of 2009 that year; she also snagged the title of 14th overall earner at just 19 years old. Watson was telling us fellow females that women can just as easily bring home the bacon and that we can overachieve as well as Hermione Granger. The Arizona representative was meeting with constituents at a supermarket in Tuscon when she was critically injured by a gunshot wound to the head in an assassination attempt. Not only did Giffords survive, but she promised to return to public service after focusing on her recovery. Douglas won two gold medals in the Summer Olympics, one for team all-around and the second for individual all-around. According to The Washington Post, Douglas said after winning, "You just have to not be afraid and go out there and just dominate." Can I get that printed on a mug, please? Pretty much unequivocally the best Golden Globes there ever was, and the awards show was hosted by two ladies. Granted, the world already knew just how funny Fey and Poehler are (and how much funnier they are when working as a pair). But the duo was so on point that night it's likely no one will ever forget: why couldn't I join Poehler in eating pie for six weeks after her co-hosting the show? What went more viral than news of India's successfully getting a satellite into orbit around Mars? The photo of those who got it done. 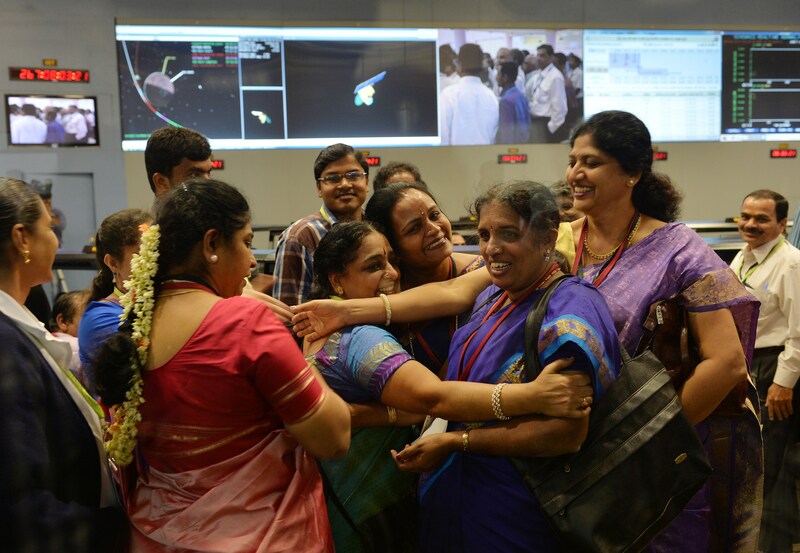 The image that circulated around the globe was one of a group of overjoyed female scientists donning beautiful saris. No need for lab coats here. December will mark the first time women in the country will vote and can run for public office. Human rights advocate and leader of the suffrage movement, Nassima al-Sadah, told The New York Times, "Men have to know that women must sit beside them in every decision-making and that their voices should be heard."